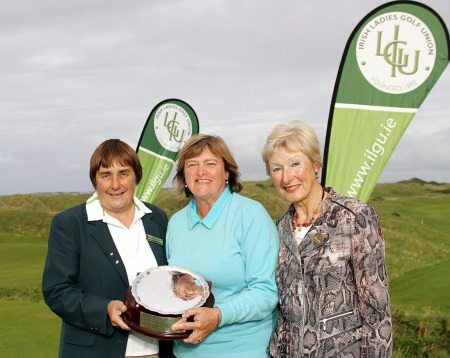 The Island's Gertie McMullen got her title defence off to the perfect start when she fired a one over 74 to share the first round lead in the Irish Senior Women’s Open Strokeplay at Dundalk. McMullen had one birdie and two bogeys on her card to end the day tied for the lead with The Heath’s Catherine Reilly. Local favourite Ita Donnelly, a seven handicapper, punched well above her weight to lie joint third overnight with an impressive 75 that was matched only by 2011 and 2012 champion Minna Kaarnalahti from Finland. Grange's Sheena McElroy is alone in fifth after a 76 with Irish international Suzanne Corcoran of Portumna lurking on 77 alongside Dun Laoghaire's Niamh Giblin, Mallow's Mary Dowling and England's Gabi Heuchel. With seven players within three shots of the lead entering the last 36 holes on Thursday and Friday, an exciting finish looks likely. As for the Nations Cup, the Ireland A trio of McMullen, McElroy and Pat Doran (80) leads by four from Ireland B's — Suzanne Corcoran (77), Mary Dowling (77) and Helen Jones  — Canada and the USA. Irish Senior Women’s Open Strokeplay at Dundalk (Par 73). Royal Belfast’s Marilyn Henderson blitzed the field to take a six-shot lead over defending champion Minna Kaarnalahti after the opening round of the Irish Senior Women’s Open Strokeplay at Rosslare. Not even a wind-blown 79 couldn stop Royal Belfast’s Marilyn Henderson extending her lead ahead of Friday’s final round of the Irish Senior Women’s Open Strokeplay at breezy Rosslare. The Island’s Gertie McMullen. © ILGUThe Island’s Gertie McMulen is tied for the lead with the American Marianne Towersey heading into Friday’s final round of the Irish Senior Women’s Open Strokeplay at Castlerock. Irish Senior Womens Open Strokeplay champion at Castlerock with Dympna Conlon (ILGU) and Dianne Stuart (Lady Captain Castlerock). Picture: David Ross/Ulster GolfThe Island’s Gertie McMullen fired a final round 79 to win her first Irish Senior Women’s Open Strokeplay title by four strokes from Canada’s Diane Williams at Castlerock.